We are pleased to congratulate Dr. Maida Galvez for being honored as an EPA Environmental Champion in recognition of her contributions to children’s environmental health. Dr. Galvez, Associate Professor of Preventive Medicine and Pediatrics, directs the Region 2 Pediatric Environmental Health Specialty Unit (PEHSU) and co-directs the Community Outreach and Engagement Core of our NIEHS P30 environmental health research center. 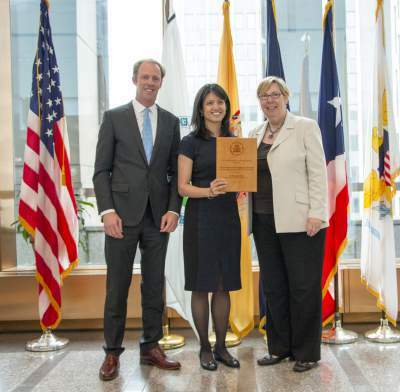 Dr. Galvez received her award from EPA Regional Administrator Judith Enck and Keynote Speaker, Murray Fisher, Founder and President of Harbor School, at a ceremony held at the Region 2 EPA Offices in the Ted Weiss Federal Building in New York City on May 13, 2016. This entry was posted in Feature of the Month on May 23, 2016 by mountsinaitceee.